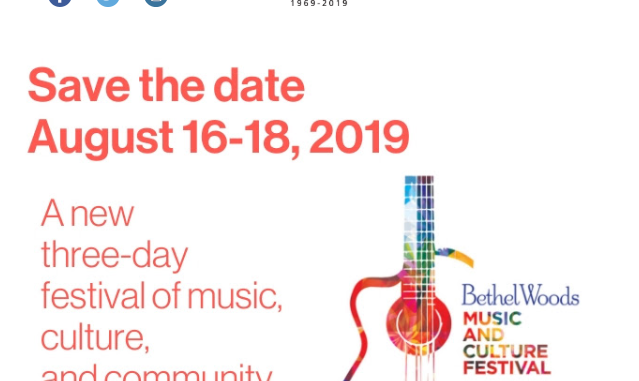 Breaking News: Bethel Woods just made the official announcement by sending a Save the Date notification and a press release about their Bethel Woods Music and Culture Festival “celebrating the golden anniversary at the historic site of the 1969 Woodstock festival.” The official dates are August 16-18, 2019 and the event will include “live performances from prominent and emerging artists spanning multiple genres and decades, and TED-style talks from leading futurists and retro-tech experts.” To learn more about the event, you can read the press release or visit the Bethel Woods website. The event is a partnership between Bethel Woods, Live Nation, and INVNT. As stated in the press release, “full details of the event line-up, ticketing, non-musical experiences, and brand activity will be released soon,” so we will be watching for more updates coming in the near future.